The Steely Dan sound, a staple of FM radio and instantly recognizable, has been a canny blend of two ingredients: impeccably crafted, rigorously complex jazz-rock performed only by the best musicians money can buy. But there has always been another, equally important element lurking beneath the smooth exterior: their lyrics, owing as much to Beat culture and science fiction as to Dylan, are the group’s real secret weapon, laced with black humor and cryptic allusions (and delivered in Donald Fagen’s inimitable sneer). It’s as if Mr. Fagen and Walter Becker, Steely Dan’s masterminds, were actually fiction writers who preferred to tell their stories musically. It comes then as no surprise that Mr. Fagen’s new quasi-memoir is several degrees more substantial than the typical musician tell-all. Opening with a profile of the obscure yet influential Boswell sisters, Mr. Fagen sets the tone for the book to follow: as he describes the “subversive genius” of this nearly-forgotten vocal group, a favorite of his mother’s, he writes with the knowing detachment of a hip jazz critic who’s apparently heard every jazz album known to man. Any reader will be hard pressed not to queue up YouTube for the Boswells after reading this deserving tribute. He follows with similar reminiscences of Ray Charles, Ike Turner, Henry Mancini, and jazz deejay Mort Fega. These pieces all feature the autumnal tone of someone who outgrew all of his idols long ago but still feels great affection toward them, as in the case of Jean Shepherd. Best known for writing what would became the holiday standard A Christmas Story, Shepherd for years performed a series of monologues on WOR radio that belied the beloved film’s rose-colored wistfulness and instead offered up slices of childhood unvarnished for kids growing up during the height of the Cold War. “Shep made it clear he was just as dazed, enraged and amused as you were, that he noticed what you noticed. He established himself as one of a handful of adults you could trust,” Mr. Fagen remembers, which makes the revelation felt after seeing his hero in the flesh years later all the more poignant. 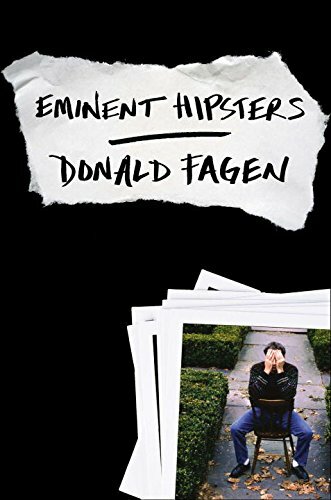 The true highlight of Eminent Hipsters is its final piece, a tour diary of Mr. Fagen’s 2012 tour with Michael McDonald and Boz Scaggs as a rock-and-soul revue called the Dukes of September. Taking up nearly half the book, the candidly funny travelogue documents the author suffering through what he calls Acute Tour Disorder, criss-crossing the country to perform for audiences filled with nostalgic baby boomers (“Tonight the crowd looked so geriatric I was tempted to start calling out bingo numbers”) or younger people (“TV babies”) who have never heard the soul music the Dukes spend much of their shows covering. Steely Dan is still a working outfit, having just completed a summer tour, though for how much longer remains unclear. But 40 years after asking if we were reelin’ in the years, Mr. Fagen proves with his generous collection that his wry voice is still worth listening to, with or without a killer rhythm section. Michael Pucci is a reference librarian at a public library in New Jersey, where he assists in developing its adult and young adult collection. He has also written about pop culture for several publications and thinks Aja is one of the most perfect albums ever made.